Measures 17'' in diameter and 17'' tall. According to historians, tall, pointed hats first became associated with witches in illustrated children’s books published in the 1700s. Nobody is exactly sure why that connection came about, but we can tell you one thing: it had to be a major bummer for everybody else who just happened to like wearing pointy hats. Imagine stepping out of your house in the morning feeling all chipper about how good you’re going to look in that extra-pointy new hat you picked up over the weekend, then realizing as you strutted down the street that all of those people gasping and pointing weren’t just whispering amongst themselves about how good you looked. By the time the first person actually yelled out “Witch!” you’d probably have gotten the picture that your fashion choice was out of style, and potentially downright dangerous. Nowadays, though, there’s no harm at all in wearing a pointy hat. Even people who believe in evil witches will generally acknowledge that they wouldn’t be careless enough to advertise their occupation by dressing like the wickedest woman in Oz. 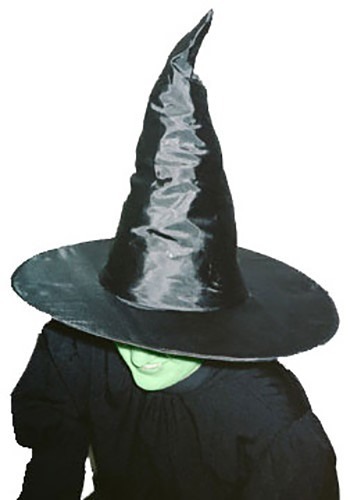 Go right ahead and slip on this hat designed in classic witch style, with a wide, round brim and a tall, pointed peak. It’s ideal for wearing to a costume party, handing out candy, or hunting down a confused Midwestern girl and her little dog. Or if you just happen to like the look of pointy hats, it’s great for everyday wear too.